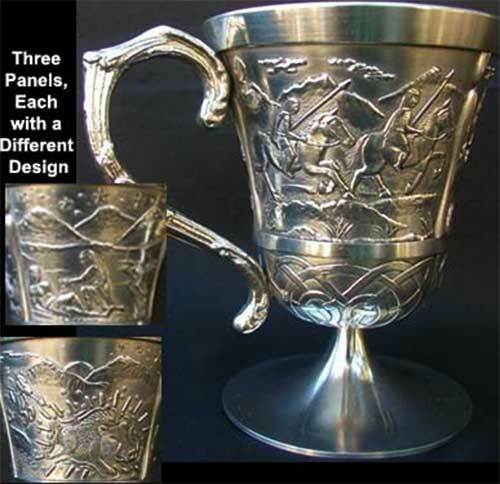 This Celtic tankard features the Na Fianna Irish legend embossed on the pewter panels. The pewter Irish legend tankard is enhanced with Celtic knot-work under the panels and it is further enhanced with a footed base along with an embellished handle. The Na Fianna tankard measures 3" wide at the rim x 4" tall; it holds 8 ounces. This Celtic tankard includes the Na Fianna Irish legend card. Na Fianna means The Soldiers. They flourished in Ireland for about three hundred years before Christ and possibly many years after that time. The Fianna made a huge mark on Irish history which continues even to the present day. Founded in the reign of King Cormac Mac Airt their noble junction was to protect the King at Tara act as defense forces and set high standards in living, in sport and in the face of great odds behave with courage. Much knowledge of them has come down to us mixed with mythology of significance probably introduced by the great early storytellers to enhance dramatic effect. These were the seannacaidhe. The Fianna belonged to the Ossianic Cycle of stories contained in many books on the subject easily obtained in Ireland and from libraries everywhere. Their most noted captain was the great Fionn Mac Cumhail (Finn Mac Cool) who taught all his thousands of young men to be like himself in character, with gentleness and always generous. The rules of the Fianna were imprinted in the minds of all its members. None could be a member unless having passed prescribed test, set by Fionn Mac Cumhail. These were extraordinary. him. Then they chased him through the forest. If overtaken, or a braid of his hair tangled on his head or a dry stick cracked under his foot or he failed to remove a thorn from his foot without stopping he was not accepted in the elite force. There was listed for compliance a set of maxims aimed at good behaviour towards his wolfhound, no charge against his wife without proof, avoid brawls, gentleness towards women, children, poets and the common people. Never by any act bring the Fianna into disrepute.